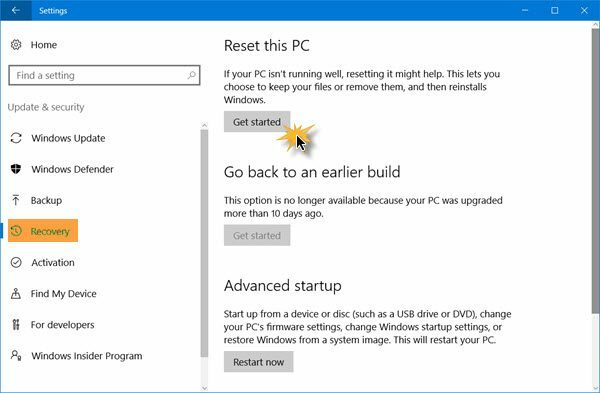 If you decide to run the Reset this PC option in Windows 10 and you find that the restoration process is failed with a warning that Some of your files cannot be removed. Microsoft is aware of this issue and has made a short post on its forums to clarify this problem. If you have Windows 10 v 1607 installed on your PC and the Get Office app version 17.7909.7600 or later is also installed then the Reset this PC operation is likely to fail, if you have selected the Remove everything option. When you reset your Windows 10 PC, all apps, drivers, and programs that did not come with this PC will be removed, and your settings restored back to defaults. Your personal files may be kept intact or removed depending on the choice you made. The reset may complete successfully at first, however some of the factory settings configured by the PC manufacturer might not be restored correctly. If you then perform “Reset this PC” with the “Remove everything” option again, the reset operation fails, said Microsoft. Microsoft is currently working on this issue and hopefully, a solution will be found soon. This post may help you if you receive a There was a problem resetting your PC message. This report just gave me an excuse to remove the app which I did not know I had installed. I fail to see my need for this app anyway. If you want Office 365 I don’t need an app for that.